Sunshine Mini | Pony Ornaments Figurines | One Price Low Flat Shipping! From the Trail of Painted Ponies Celebration Minis Collection, Sunshine. Made of hand-painted resin. Measures 3.45" tall. Comes in Painted Pony collectible gift box. 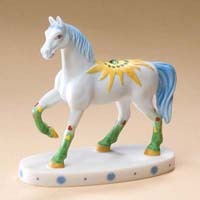 This painted pony mini figurine features a yellow sun on its back with a circle of small faux emerald gemstones ringed around a larger one in the center of the saddle. It is featured in a standing pose with red and yellow hearts painted against a grass green background on all its hooves. Miniature hand-painted Ponies celebrate birthdays, holidays and lifes special occasions throughout the year. Each includes a gemstone as the perfect finishing touch!